What is it with Sylvester Stallone? Firstly, his name is Sylvester, then how is it that this man of sixty-six years of age is having the all-mightiest of returns I have seen in ages! I mean this return rivals the size of his Mother Jackie’s lips! Search the net for news of this, wait, Actor/Writer/Producer/Director, and the man is certainly looking well for his age. And so he should be. With the release of The Expendables 2 in Oz a fortnight ago, and decent box-office globally already, it seems The Expendables will manage a further sequel (No 3). This will make the third franchise Power-House Stallone has invented. And it is truly his leadership behind all. From 1976’s break-out Rocky (the guy worked for practically zip, and wrote it) to 1982’s First Blood (Rambo), Stallone has made some clunkers between, but he definitely deserves his Super-Star-Movie-Star title. With The Expendables 2 doing good box-office and the subsequent announcement there will be a third, 2013 sees Stallone acting in the lead of two additional high-profile films to be released. Bullet to The Head will be the first and is directed by well-known Producer of numerous films in the Alien franchise, Walter Hill. Second is The Tomb. 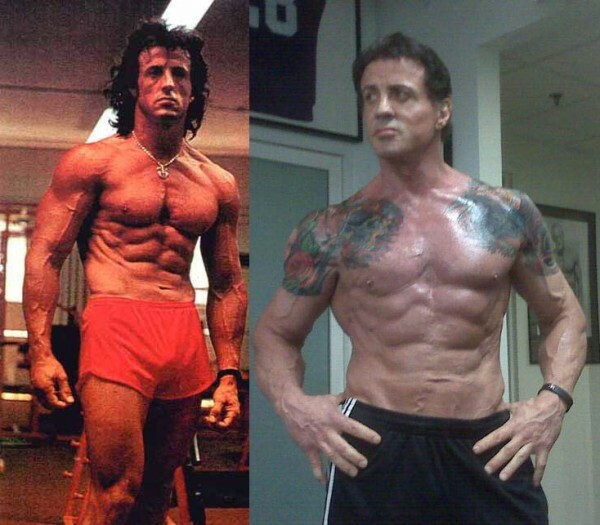 Co-starring his The Expendables co-star Mr Arnie Schwarzenegger, who said age got old. Rock on Sylvester! And yes, the pic is a 1970’s pic and now… gee-zus! It makes me think I should give up KFC for good! This entry was posted on Wednesday, September 12th, 2012 at 1:21 am	and posted in Uncategorized. You can follow any responses to this entry through the RSS 2.0 feed.